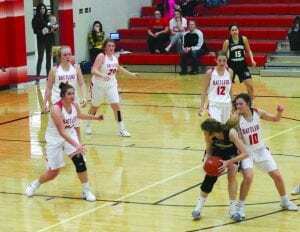 The Potter County Lady Battlers put a pressing defense into play during their game against the Edmunds Central Lady Raiders on Thursday, Jan. 17, but the visiting team went home with the win. Pictured clockwise from left for the Lady Bs are Paige Worth (Carmen and Bart), Jenna Robbennolt (Rena and Brian), Kayla Sautner (Lori and Chad), Autumn Wieseler (Ben Wieseler, Deb and Justin Cronin), and Kirstie Lake (Bridget and John). The basketball teams will play at GHS on Friday night in double header action against Sunshine Bible Academy, and again on Tuesday when they host Redfield/Doland.